A few vegetables that add texture. I chose mushrooms and water chestnuts. Tons of ginger and garlic to boost flavor. If you don’t have ginger, you can use one more clove of garlic and skip the ginger. A simple sauce that brings out the flavor of the ingredients. 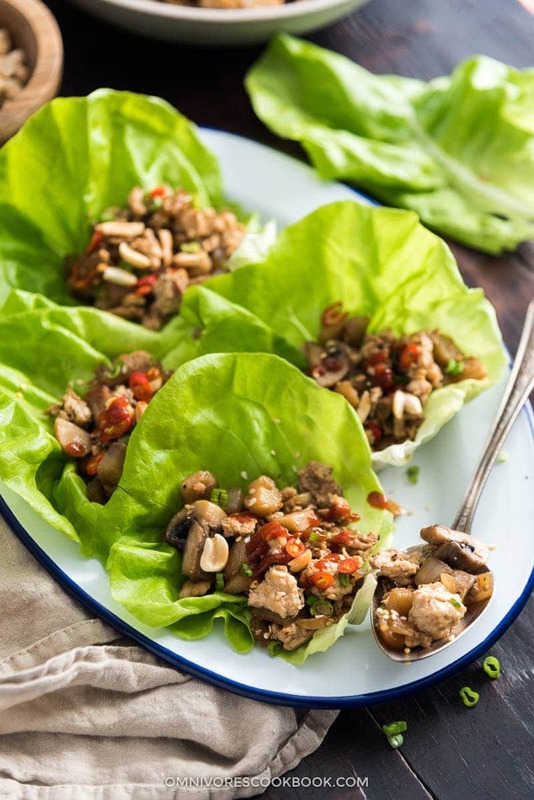 A lot of chicken lettuce wrap recipes use hoisin sauce during the stir fry part. I prefer to skip it during cooking and use it as a serving sauce, so it makes the wrap extra saucy. If you don’t have hoisin sauce, definitely try out my homemade version. It works great in this dish. Sometimes I choose ground turkey with 20% fat over ground chicken, which produces more tender and juicier meat. If you use ground chicken breasts, pay extra attention to not overcook the meat. It will end up very tough and dry. I recommend browning the ground chicken first and taking it out before adding other ingredients. My recipe uses tons of mushrooms and water chestnuts. If you cook everything at the same time, the pan will be too crowded and difficult to keep at a high temperature. The chicken meat won’t brown properly. Instead, it will end up being boiled and losing all the juices. 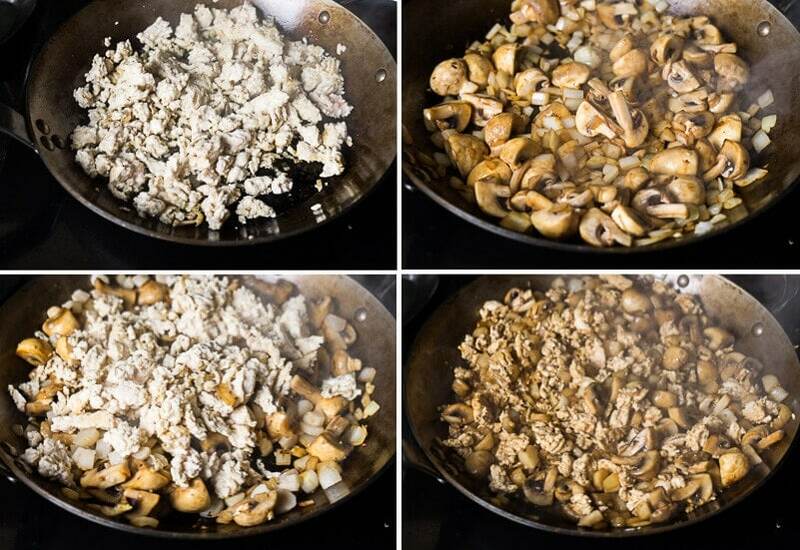 What you don’t need to do is dice the mushrooms to tiny pieces – quarter them instead. It is true that Chinese stir fry recipes usually call for cutting all the veggies into the same size for even cooking and better presentation. But, in this case, mushrooms shrink a lot after cooking, so cutting them to bigger pieces will result in better mouthfeel. To make the preparation easier, use a garlic press to mince garlic and use a lemon zester to mince the ginger. The recipe below might look long, but you’d be surprised how quickly you can prep these ingredients. 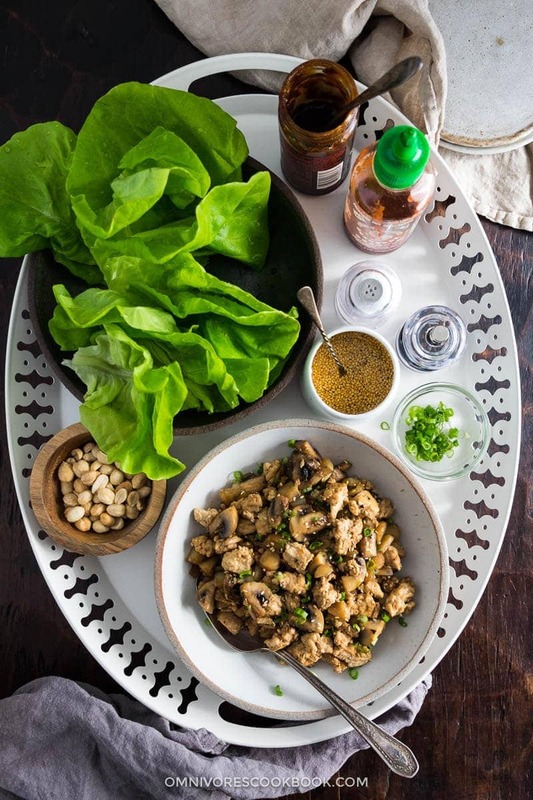 Serve the dish the family style without assembling it first, so the right-off-the-stove chicken won’t wither the lettuce leaves. Plus, it allows each family member to choose their own favorite toppings and sauce. It makes the dining experience much more fun. The dish is enough for six if serving as appetizer. It makes a light dinner for two serving as main. Mix all the ingredients for the sauce in a small bowl. Heat 1 tablespoon oil in a large skillet over medium high heat. When the oil is hot, add ground chicken. Chop and stir, until separated to smaller pieces and the surface turns light brown but the inside is still a bit pink. Transfer the chicken to a plate and set aside. If your chicken sticks to the pan, pour in a tablespoon of cooking wine (dry sherry, Shaoxing wine, etc.) or chicken stock to deglaze, and transfer the brown bits to the plate with the chicken. 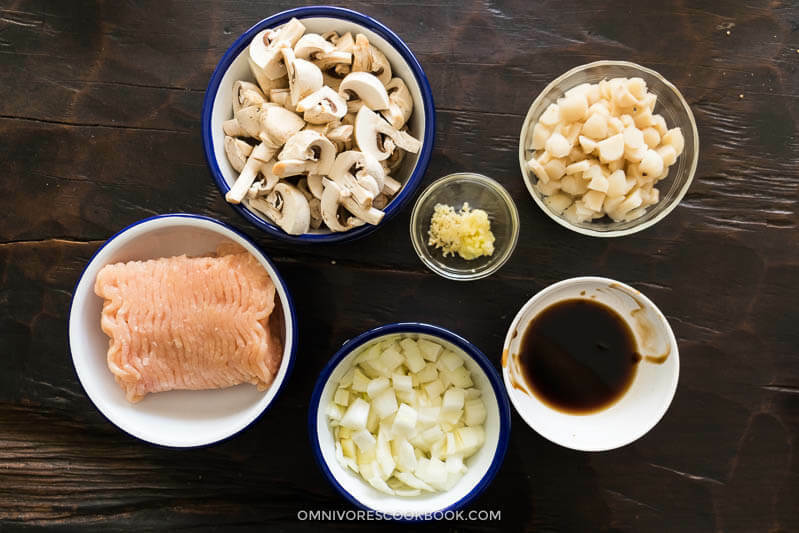 Add the rest – 1 tablespoon oil, onions and mushrooms. Cook until the onions turn tender and the mushrooms are browned. Add the garlic and ginger. Cook for a few seconds to release the aroma. Add back the cooked chicken and water chestnuts. Pour in sauce. Stir to mix well, until the sauce is mostly absorbed. Carefully taste the chicken. Adjust the seasoning by adding salt, if necessary. I prefer to not season too much during this stage because you might use other sauces to serve the dish. 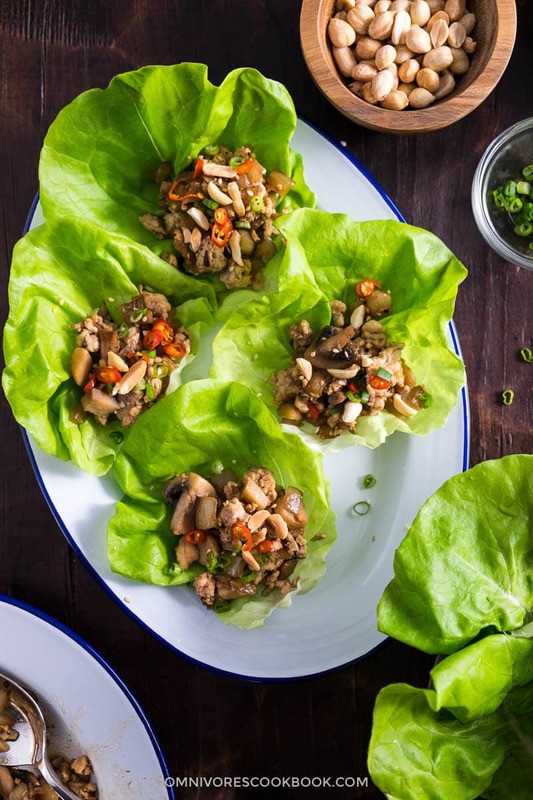 Transfer the chicken onto a big plate and garnish with the green part of green onions and sesame seeds, if you’re using them. 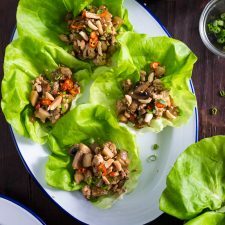 Serve warm with separated lettuce leaves, chili oil (or any other hot sauce you prefer), hoisin sauce, and chopped nuts on the side. 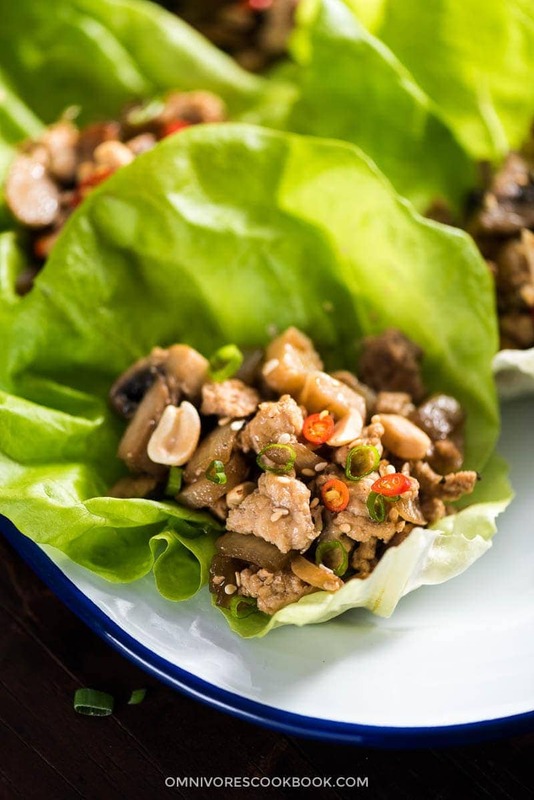 To eat, spoon the chicken mixture into the center of a lettuce leaf and add any preferred toppings. Enjoy it tacostyle! Tried your lettuce wrap. Delicious. Chicken and nuts were crispy together and complemented by the hot sauce. Brought tears to my eyes: but tears of joy. Hey Maggie. Definitely giving this recipe a wack tonight. Am I crazy or are there no such thing as water chestnuts in Beijing? I saw that I could buy fresh ones online but…being Americana in my ways, I would have no clue how to prepare them unless they were just a can opener away from perfection. Bad chef. Anyway, I will replace the crunchiness with probably some arrowroot or carrots. Very excited to try this out! Glad to see you here Kara! To answer your question, water chestnut is quite a seasonal thing and you should able to find them in market in summer. And yes, most of the time we use the fresh ones. You need to be very patient and peel one by one with a pairing knife. It is something you do on a weekend while watching TV. You can find peeled water chestnut in a jar in big supermarket, but it’s not as common as in the US.